I don’t usually write a piece about the cats I have in but the last few months has had so many ups and downs I thought I would put fingers to keys and change that. I have been with the branch for 10 years now and fostering for 8. In my three pens at the bottom of my garden I have seen many cats come and go. There are always the special ones that stand out in memory but the last three cats I have homed shall always be there in my mind. My background is in Veterinary Nursing and more specifically than that, feline behaviour. Therefore I usually have a least one cat with “issues” that hangs around for a little longer. These last three though really were a challenge and they were all in at the same time. I’ll start with Daz. Daz turned up during July in the laundry department at Millfield. Who knows where he came from? A large black beast of a cat but so gentle in nature. My children loved Daz and my oldest daughter would sit down and read the Chronicles of Narnia to him. He was homed once quite quickly after he came in but the new owner bought him back. There were a few reasons but none were the fault of Daz. He then sat in that pen for another 4 months. Despite regular homing campaigns not a single person called me about him. Finally 8 months later a couple came to visit him. As soon as his prospective owner sat down in a chair up Daz jumped onto his lap saying “yes you’ll do nicely”. Next in was Max. Max was put into a box by his owners neighbour, driven 30 miles to Wells and let out of his box. He was picked up by a member of the public and taken to a vet, here he was scanned and his owner located. Three months she had been waiting for a call. Her neighbour had even admitted to her what he’d done. She decided he couldn’t come back because her neighbour had said he’d just dump him again. So she signed him over. By the time Max came in he was very nervous and not trusting of anyone. The only person he would let near him was my 8 year old son William. It took weeks until I could go into his pen and him not hiss at me. Poor Max just did not know what the hell was going on. After about 6 weeks I went in one day and it was like overnight he decided I was ok. Up onto his shelf he jumped and without a hiss or a spit budged his breakfast right out of my hand and said “hi”. We never looked back after that and during February his new family came forward and took him home. 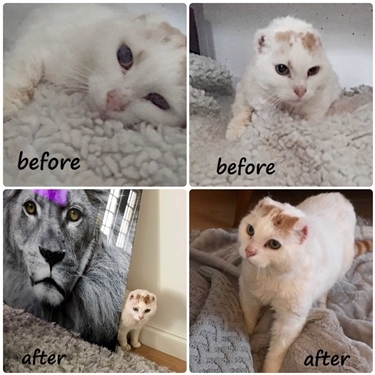 Next up we have Hector (seen in the before and after photos). A stray from West Pennard, he arrived during October. He was the most overweight stray I have ever seen. If you have ever read the childrens book “Six Dinner Sid” well that was him. If you haven’t read it I’m sure you get the idea! Anyway, Hector was covered in oil. He had been sleeping under cars and was too overweight to clean himself properly. Hector also had sores on his ear tips which I knew was going to be cancerous. To add to that he also had an awful limp. Off to the vets he went for a full MOT. They found that some time ago he had fractured his hip and it had healed in an odd position and that was what caused his limp. Cancer on his ear tips was confirmed and so he had to have those removed. Being a stray we had absolutely no idea what his temperament was really like. Hector would just hide at the back of his pen and only come out to eat when it was dark. Day after day I’d go down and all I could do was tickle the top of his head. I was beginning to despair and was thinking is it fair to keep him going like this? Something though in the back of my mind was telling me to keep going. I’d spend time down there sitting and reading in the evenings. He’d gradually let me stroke and brush him. He’d never come out to me though. Time passed and then I had a phone call from an angel, the most perfect home. Someone who didn’t mind if he spent the next few weeks hiding, someone who was willing to give him time. I did the home check. His new owner came to visit; I couldn’t believe it he was all over her. I must admit I was overjoyed but also a little bit jealous. I took him to his new home in March, I opened the box. He got out and was looking around his new home, rubbing around my legs and purring away. He was a completely different cat. It has been a very difficult few months. If you have taken note you will realise that those cats were in foster care between 4 and 8 months. That’s a long time. I couldn’t do this without the support of my husband, children and two amazing cat cuddlers. We are all busy and there have been times when I have thought I could really do without all of this. There will be more cats like Daz, Hector and Max and they are the reason that I will keep going. We are in desperate need of more fosterers. If you have ever thought about volunteering I would urge you to get in touch. I think you’ll be surprised as to how much these little lives have to offer.